This summer will likely be remembered above all for the number of massive public events taking place both in the UK and abroad, not least the Royal Wedding in May and the World Cup a month later. These kinds of occasions have always possessed immense power to bring people together, mobilising as they do incredibly influential discourses around national identity, loyalty and so on. This is even more the case nowadays with broadband-enabled technology giving people the opportunity to debate such events with half the world’s population. The way in which content is consumed is also fundamentally different in 2018 from the way things were when Bobby Moore lifted the Jules Rimet trophy 50 years ago. This is not just down to an increasing number of media outlets covering these events, but also apps such as Periscope and Facebook Live enabling those in attendance to upload their own footage. As impactful as this kind of sharing has already been on the producers of ‘official’ content, the expectation on the part of consumers to be able to send and receive increasingly enormous chunks of data is also now a major consideration for those operating event venues. 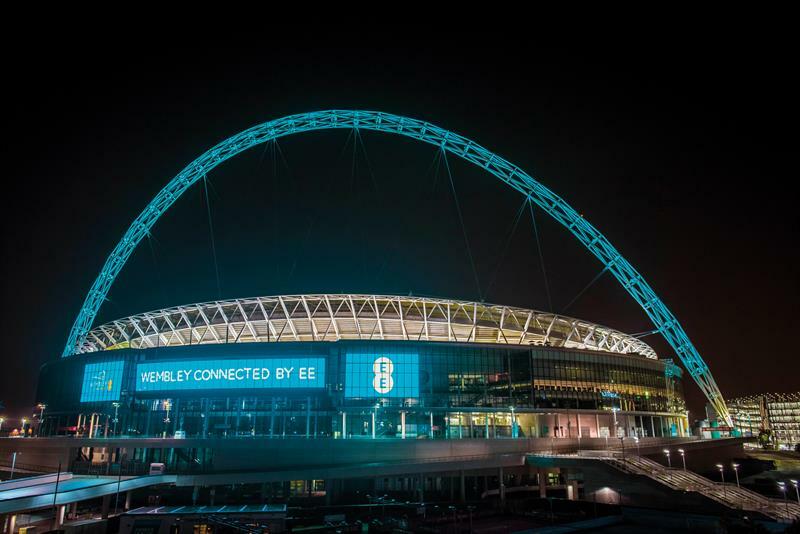 The most high-profile example of such a site in the UK is Wembley, which its communications partner EE (as recently purchased by BT) has undertaken to make ‘the most connected stadium in the world’. Working on the basis that they have already bought their data from EE, visitors to Wembley Stadium are currently able to take advantage of LTE-A, which is accessible across the site. This already gives the MNO a clear advantage in the PR stakes, particularly with people on other networks – according to BT Sport’s head of mobile strategy, Matt Stagg – regularly asking to borrow their friends’ phone during events as the life is throttled out of their own signal by the sheer number of competing users. EE’s offering aggregates all three portions of its spectrum portfolio (800, 1800 and 2600MHz), distributing it to different parts of the stadium according to need. As indicated, short of uploading oceans of video content in real time, this seemingly provides users more than enough coverage and bandwidth to do what they feel they need to do. However, according to Stagg, it is with 5G where the situation will start to get really interesting, following the company’s purchase of 40MHz in the 3.4GHz band during Ofcom’s spectrum auction earlier this year. Another area of Stagg’s thinking is around the IoT piece, with sensors (or, indeed, wearables – see below) theoretically deployed to monitor a player’s vital signs, for instance when they are about to take a penalty. According to him, this use-case-first approach is indicative of the way on-the-ball operators are likely to approach the deployment of 5G and the degree to which the technology will be driven by the expectation of the user rather than the other way around. “The thought process now is ultimately around what we’ll be able to do that we couldn’t do before, over and above providing lots of bandwidth,” he says. “That includes edge computing, remote production, as well as taking advantage of low latency and network slicing for different purposes within the stadium itself. For sports fans, 5G has the potential to completely revolutionise the match-day experience. This could include anything from the ability to see through a defender’s eyes as they go in to try and tackle a star striker, to a spectator uploading endless game footage to their social media accounts. One of the most truly game-changing – pun intended – possibilities could be the ability to view statistics relating to the activities of individual players, generated throughout the course of a sporting event. Without wanting to get too sci-fi about it, this could in theory be delivered via an augmented reality application (picture recent film Anon crossed with Match of the Day), offering up metrics such as ground covered, time spent in different areas of the field and so on. While the broadband infrastructure necessary to provide this kind of added value to 70,000 people at the same time may not yet exist, these kind of real-time ‘Moneyball’ stats are already being used by elite sporting organisations to monitor the performance of their players, both during match day and on the training ground. Two core companies operating in this field are Taoglas – which provides GPS antennas – and STATSports, which develops the company’s antenna technology into applications through which the resulting location data is transmitted, conceptualised and viewed. For Taoglas, this is achieved through the use of circular polarised antennas, which allow greater freedom in terms of deployment and orientation, as well as improved compatibility when it comes to signals broadcast from GNSS satellites. According to Quinlan, the maximum drop in performance is somewhere around three decibels, compared with the 40db he claims would be the case if linear antennas were deployed. The situation is further complicated by the need for players to ‘roam’ between satellites, while at the same time still incurring a minimal amount of disruption to the signal. This is something which Taoglas says is solved by simply making its technology conversant with a variety of GNSS solutions, meaning not just GPS but also the Russian Federation-operated GLONASS system and the Chinese government’s BeiDou. He continues: “In terms of getting the information from the device to a central control point on the ground, companies are using Bluetooth, as well as starting to experiment with ultra-wide broadband, which will obviously bring massive benefits in terms of the amount of data available. STATSports’ Apex solution (which takes the form of a small ruggedised unit, stitched into a player’s jersey) was announced as the player-monitoring solution of choice for the Brazilian Football Confederation ahead of this summer’s World Cup in Russia. Other recent high-profile adopters include Hockey Ireland, Western Michigan University’s football programme, as well as the English Football League team nearest to your correspondent’s heart, Portsmouth FC. Discussing the metrics provided by the solution – and the method through which it provides them – Quinlan says: “The antennas are just one part of an extraordinarily sophisticated fusion of technologies, including accelerometers, magnetometers, gyroscopes and so on. As in many other aspects of human life, next-generation digital communications technology is set to fundamentally change not just how we view sport, but also how it’s played. At the same time, the monitoring applications exemplified by the likes of STATSports have huge implications, for instance, if and when the technology starts to be used to monitor the health or movements of ordinary people.